Brother and sister duo Iain and Joanna Hyde bring together the traditions of Irish, bluegrass, and folk/Americana music to create textured instrumentals and rich vocal harmonies. Iain (guitar, mandolin, fiddle, vocals) and Joanna (fiddle, vocals) grew up in a musical family in Colorado, traveling the state and region to share their music at festivals, house concerts, and various music venues from their elementary school days onward. Alongside his career in public policy and disaster recovery, Iain has composed, performed, and taught music throughout Colorado, the Midwest and in Nashville, Tennessee. Joanna has returned to Colorado from Limerick, Ireland, where she has spent the past 3 years studying Irish traditional music and teaching at the University of Limerick’s Irish World Academy of Music and Dance, as well as performing around the country and more broadly in Europe. As a recipient of the Jack Kent Cook Foundation’s Graduate Arts Award, Joanna completed her MA in Irish Traditional Music Performance from the University of Limerick in 2014. 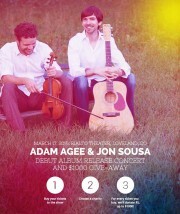 Adam Agee & Jon Sousa CD Release Concert and St. Patrick’s Day Celebration. Come celebrate Saint Patricks’ Day with us! We will be joined by former Riverdance professional dancer Billy Kanaly and stellar vocalist Emily Dawson as special guests for this evening as we journey through the traditional Irish music that we love to share with you. We are celebrating the legendary release of our first duo-album, Suantraí. It is legendary mostly because we took so long to make it happen… but now it is here, and it represents a decade of playing together, featuring tunes we collected while living in America and Ireland. We’ve gathered together our favorites and will share them with you on this coming Tuesday night in Loveland! We have built a web page especially to celebrate this event: www.adamageejonsousa.com/tix. When you visit the page you can buy tickets, participate in the charity give-away, and listen to our music. Here’s the other thing: we have $1000 we have gradually saved up from playing together, and are ready to give it away to charity. But we want you to join in the fun of giving it away. For every ticket you buy through our website, you get a charity token worth $5, and you get to help us choose where to put it. 1. Share this event and our webpage on social media or any relevant blogs or community email lists you contribute to. 2. You can buy tickets and become an anonymous “Seat Sponsor,” and we will offer your purchased seats to others for free! After the show we are going to go just beside the Rialto to Next Door food and drink, where we will hang out and celebrate. If you bring your ticket, you can get 10% your purchase there on the night of the show. We hope we’ll get to see you on this special day! Six-time Grammy Award winners, The Chieftains, have been highly recognized for reinventing traditional Irish music on a contemporary and International scale. The Chieftains were formed in Ireland in 1962 by Paddy Moloney, one of the top traditional folk musicians in Ireland. Their ability to transcend musical boundaries to blend tradition with modern music has notably hailed them as one of the most renowned and revered musical groups to this day. After more than fifty years of making some of the most beautiful music in the world, The Chieftains’ music remains as fresh and relevant as when they first began. Dennis Gallagher's "Last Hurrah St. Patrick’s Day Party"
I have been hosting my annual St. Patrick’s Day Party for well over thirty years. And each year it gets bigger and better and this year will be no exception; in fact it will be the biggest and best yet. Because it is the last party I will host as an elected official – yes, I will leave public office in July after forty four years – I am calling this one The Last Hurrah Party. I hope you will join me and of course, tell all your friends. The celebration will include all my usual elements: the traditional Irish dinner, step dancers, pipers and more, as well as my popular silent auction. And because I have closed my campaign account (which in the past is how I paid for the party) this year the party is co-hosted by the non-profit, Education on Public Service, which produced the documentary on my life and career. The party will again be at the Police Protective Association, at 21st and Decatur – near Mile High Stadium (yes it is still Mile High Stadium to me). The party begins at 5pm and goes to 8pm on Sunday, March15. The 2015 Denver St. Patrick’s Day Parade will step off at 9:30 a.m. on Saturday, March 14th, and will be led by Grand Marshal Thomas J. “Dr. Colorado” Noel. The parade will begin near Union Station, travel to Blake, march east on Blake ending at 27th street. The 2015 parade theme “Emerald Mile” is a tribute to Colorado’s Irish heritage, but also to the diverse background on a day when “Everyone is Irish.” The Denver St. Patrick’s Day Parade is unmatched this side of the Mississippi with more than an estimated 350,000 people lining the streets of the Mile High City for the celebration. Grand Marshal Tom Noel, in addition to being a celebrated author of more than 40 books, is a history professor and Director of Public History, Preservation and Colorado Studies at the University of Colorado Denver. 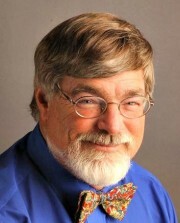 He also appears regularly on local media including 9News’ Colorado & Company and writes a regular column on Colorado history for The Denver Post. 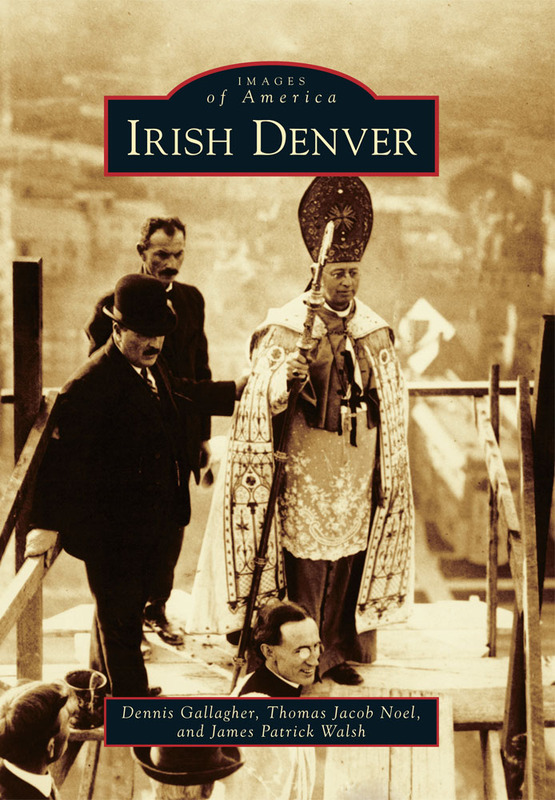 Among the books Noel has published are Irish Denver (With former parade GM Dennis Gallagher and Tom Walsh), Colorado Catholicism, The City & The Saloon, and Colorado: A Liquid History & Tavern Guide to the Highest State. Noel’s role as Grand Marshal is joined by his charitable partner the Western History/Genealogy Department at the Denver Public Library, headed by Jim Kroll, one of Noel’s former University of Colorado Denver graduate students. The department’s Western History collection houses more than a million photographs of downtown Denver and historic Denver neighborhoods, including historically Irish communities. In early 2015, the department will add an additional 400,000 digital images from the Rocky Mountain News on the library’s website. March is the month that is synonymous with the Irish. All over the world parades and festivities will commemorate and honour St. Patrick, the Patron Saint of Ireland. All of us, Irish or not, get swept up in the joy of the occasion. Here in Montana we have always been very creative when it comes to celebrating St. Patrick’s Day and the great contribution the Irish have made to our state. This year will be no different. The Irish Studies program, the Friends of Irish Studies and the Ancient Order of Hibernians have joined to put together a program of events that will appeal to all tastes. There is music, film, sport, history, dance, a parade and a banquet and auction to ensure the continued growth of the Irish Studies Program and Irish culture in Montana. 1. March 6 and 7 – Irish Fiddle Concert: Fiddle maestro, James Kelly, plays the Montana Tech Library Auditorium on Friday, March 6 and the UM Recital Hall in Missoula on Saturday, March 7. Both concerts begin at 7:30pm. 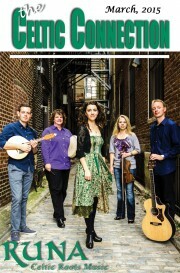 Tickets are $15 at the door, $10 for students and Friends of Irish Studies, and are available in Butte at Cavavnaugh’s County Celtic, in Missoula at Rockin Rudy’s or online at www.friendsofirishstudies.com. 2. March 10 – St. Patrick Lecture: Dr. Traolach Ó Ríordáin will deliver a free public lecture at St. Anthony’s Parish Life Center, 217 Tremont, on Wednesday, March 11 at 7:00pm. We would encourage you to attend this presentation; you’ll be very surprised at what you learn about Ireland’s greatest saint! 3. March 12 – Irish Film Night: The Roxy Theater will host the second annual Irish film night on Thursday, March 12. The first film, Song of the Sea, is an Academy award nominated animated film that draws its story from Irish mythology. It’s a family film and the kids will love it. The show begins at 5:15pm. The second presentation is Scéal ar Butte, a documentary in Irish with English subtitles about three brothers who emigrate from Ireland to Butte with tragic consequences. It is a beautiful and sensitive portrayal of life in early 20th Ireland and Montana. Tickets are $6 per showing; $10 for both features; and $12 a show for families. 4. March 14 – Irish Mass: The Holy Sacrifice of the Mass will be celebrated in honour of St. Patrick at 8 am on Saturday, March 14 at St. Francis Xavier Church. The Ancient Order of Hibernians and the Knights of Columbus will serve and all are invited to attend. 5. March 14 – St Patrick’s Day Parade: The St. Patrick’s Day Parade will set off at 12 noon. All participants are asked to line up by 11 am. Dr. Dan Combo is this year’s Grand Marshall and Mr. and Mrs. Jerry Thane are Irishman and woman of the year. We encourage you all to attend as we honour these great Irish people. 6. March 14 – Hurling Game: The Montana Grizzlies’ hurling team take the field at Washington Grizzly Stadium at 2:30 pm. This is the team that took the nation by storm last year and won the National Collegiate Championship. Hurling is the oldest and fastest field sport in the world. Celebrated in ancient Irish saga, it was on the hurling field that the great heroes of Ireland first showed their mettle. If you have never seen it, go watch this game. The excitement will take the March chill out of your bones a lot faster than an Irish whiskey. 7. March 14 – St. Patrick’s Day Banquet and Auction: This evening is the closest you’ll get to a gathering of the Irish clans, all coming together in support of their shared heritage and culture. 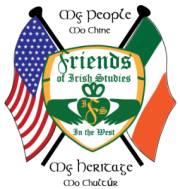 It is the Friends of Irish Studies main Fundraising Event for the Irish Studies program. There is a live and silent auction with a selection of items mostly Irish in theme and origin. The night is filled with great music, dance and conviviality. The event takes place at the Double Tree Hotel in Missoula and begins with a cocktail hour at 6pm. 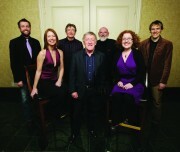 Tickets are $30 per person and all information is available at www.friendsofirishstudies.com. 8. March 17 – St Patrick’s Day Dinner: St. Anthony’s will hold their annual St. Patrick’s Day dinner at the Parish Life Center, 217 Tremont. The evening begins at 5:30 pm and goes until 7:30 and there will be lashings of corned beef and cabbage to go around. Irish musicians and dancers will provide the entertainment. The costs of the tickets are $10 each in advance and for seniors; $12 at the door; and $4 for kids. Children under $5 are free. For more information, call 543-3129. 9. March 20 and 21 – Irish Traditional and Contemporary Music: Liam Ó Maonlaí of the Hothouse Flowers will play Montana Tech Library Auditorium on Friday, March 20 and the UM Recital Hall on Saturday, March 21. This gifted musician and singer is one of Ireland’s most popular performers. This final music event is not to be missed. The concerts begin at both locations at 7:30. Tickets are available in Butte at Cavanaugh’s County Celtic, in Missoula at Rockin Rudy’s and online at www.friendsofirishstudies. 10. March 22 – Win a Trip for Two to Ireland: The drawing for the trip for two to Ireland takes place at 3 pm at St. Anthony’s Parish Life Center. If you haven’t bought your ticket yet, time is running out. You get them at Bert and Ernie’s and at O’Malley’s in Helena; Cavanaugh’s County Celtic in Butte; The Stone of Accord, The Thomas Meagher Bar and all Noon’s gas stations in Missoula. The tickets are $5 each or $25 for a book of six. They make great St. Patrick’s Day gifts and all proceeds go to support the Irish Studies Program at UM and to promote Irish culture in Montana. Rediscover the thrill of live music by joining The Denver Brass along with their Celtic family in, Celtic Fantasy, March 13 & 14 at 7:30pm and March 15 at 2:30pm all at the Newman Center for the Performing Arts. The Denver Brass will collaborate with Celtic Colorado Pipes & Drums, Wick School of Irish Dance, Rocky Mountain Highland Dancers, Todd Teske, tenor and Iain & Joanna Hyde on fiddles and guitar. This year’s show plays with the idea of a fantasy world full of magic and mythical creatures. Be sure to join us for this mysterious, magical adventure! Grown right here at home, The Denver Brass is a style-melding band of 14 professional musicians. They are dedicated to enhancing the quality of life in Colorado audiences by presenting fresh and exhilarating shows that feature all musical styles. One of just a few professional large brass ensembles in the world, The Denver Brass enjoys a success directly linked to its universal appeal. The musicians are all full-time professionals and live all along the front range of the Rockies – from Colorado Springs to Denver, Longmont and Breckenridge. For more information, concert schedule and ticket sales please call 303.832.4676 or visit DenverBrass.org. Tickets starting from $22; child, student and senior discounts available. cost of dinner. Voter registration sign up sheets available. To get a copy of their book, Irish Denver. Tix $22-56. “Legends of the Celtic Harp” with Patrick Ball, Lisa Lynne and Aryeh perform in TAOS Thursday March 5, 7:00 PM at the Harwood Museum of Art, 238 Ledoux Street in Taos, New Mexico 87571. 575.758.9826 or www.harwoodmuseum.org; SANTA FE Saturday, March 7, 7:30 PMUnity Santa Fe, 1212 Unity Way in Santa Fe 87505. http://www.brownpapertickets.com/event/1173749; ALBUQUERQUE Sunday March 8, 3:00 PM; First Unitarian Church of Albuquerque at 13701 Carlisle Blvd. NE in Albuquerque. 87110. http://www.brownpapertickets.com/event/1219539. March 15 Sunday New Mexico Irish –American Society Annual St. Patrick’s Day Party, 1:00 at the GAC Albuquerque. March 16,7PM Resolana Celebration featuring SIHASIN, Saoirse, The Celtic Singers of New Mexico, and poets, at South Broadway Cultural Center, Albuquerque Free admission. American Center in Expo New Mexico. March 17 Tuesday Women of Ireland, 7:30 PM at Popejoy Hall.